Ask any tourist about Poland and you might get a mumble of beautiful cities, vodka, communist rule, Pope John Paul II and Euro 2012. While touring the country I realised that this was a nation of resilient people who have survived decades of difficult times to emerge as one of the fastest growing economies in Europe and the world. I decided to speak to some locals to find out more about the country, culture and people. Here are 55 facts I picked up to help make your visit even more meaningful and interesting. 1) Nearly 35% of the 60 million Poles live abroad and large Polish speaking communities can be found in the US, Canada, UK, Germany, Australia, Brazil and Argentina. 2) The name "Poland" originates from the name of the tribe "Polanie" which means "people living in open fields". 3) It has been invaded or has fought for freedom in insurrections 43 times from 1600 to 1945. 4) The highest mountain in Australia was named in 1840 by Polish explorer Paul Edmund Strzeleck as Mount Kosciuszko because of the mountain's resemblance to the Kosciuszko Mound in Krakow. 5) The 1st floor is regarded as floor "0" so you press "1" when you want to go to the 2nd floor in the elevator. 6) Famous English novelist Joseph Conrad's real name was Teodor Józef Konrad Nałęcz-Korzeniowski (3 December 1857 to 3 August 1924). 7) Poles are well educated. 90% of Poland's youths complete at least secondary education and 50% have an academic degree. 8) It adopted the first constitution of its type in Europe and the second ever in the world after that of the United States on 3 May 1791 and was in effect for only 14 months and 3 weeks. It was referred to as "the last will and testament of the expiring Country" and of Polish sovereignty before Poland entered into 123 years of partition. 9) It held its first free elections in more than 40 years in 1989. 10) Historians believe that 284 Poles who were seen as threats to the communist regime were murdered and buried by Stalin's secret police between 1945 and 1956. An exhumation at the military cemetery in Warsaw by the Polish Institute of National Remembrance is a part of a nationwide project to find the final burial places of the victims of Communist terror and to identify the bodies. 12) It boasts 17 Nobel prize winners, including four Peace Prizes and five in Literature. 13) It contributes soldiers to the North Atlantic Treaty Organization's (NATO) International Security Assistance Force (ISAF) in Afghanistan; maintains troops in the Balkans, mainly in the NATO Kosovo Force; and is contributing a full battalion to the NATO Response Force, with soldiers on call for rapid deployment. 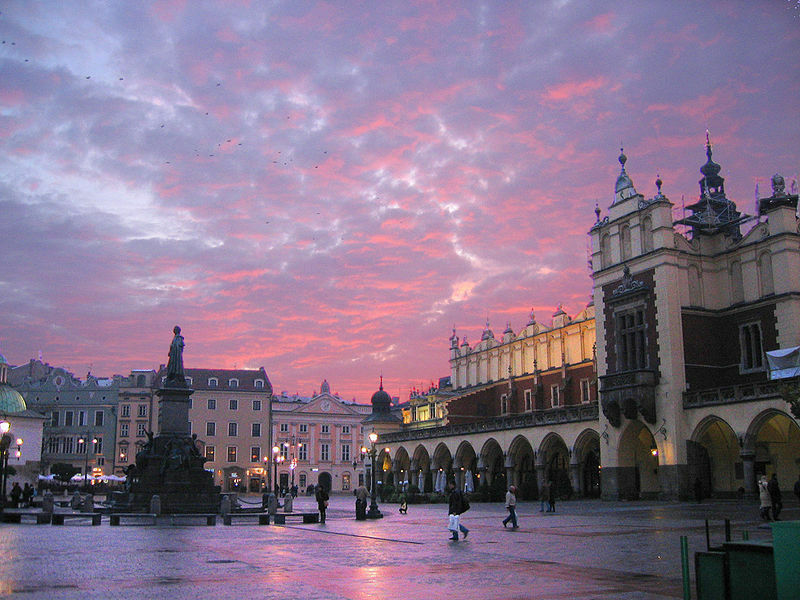 14) Kraków was the headquarters and the place of coronation of Polish kings and the nation's capital from 1038 until the move to Warsaw in 1596. 15) It was the centre of the Euopean Jewish world with 3.3 million Jews living in Poland. 16) 3 small cycle-cars called the SKAF, which sat 2 persons and could go 25 m.p.h in 1921 and a 4-seater car named the Polonia, which went 60 m.p.h in 1924 were the only Polish-made cars. 17) Located in Wrocław is the oldest restaurant in Europe, "Piwnica Swidnicka", operating since 1275. 18) It was "stolen" between 1772 and 1795 when the country was divided between Russia, Prussia and Austria and erased from the map. In 1807, Poland was reborn as the Duchy of Warsaw under Napoleon Bonaparte but his defeat in 1815 ended with Poland being partitioned by Austria and Prussia. 19) The Fiat was the first mass produced car in Poland and 10,000 were sold before the eve of WWII. 20) Polish has the second largest number of speakers among the Slavic languages after Russian. 21) The first surviving Polish recipes cookbook dates back to 1682 with dishes influenced by strong Lithuanian and Tartar-Turkish influences and German culinary traditions. 22) The biggest section of any grocery store in Poland is the candy section. 23) It is among the world's biggest producers of hard coal. Poland's reserves of hard coal are estimated at 45.4 billion tons, enough to meet the country's demand for almost 500 years, twice as long as the world's average. 24) I have to agree that the Polish language is a difficult language to master for non-native speakers especially with its tongue-bending pronunciation and complex gender system. 25) Famous musical composer Frederic Chopin was Polish and he was born in Żelazowa Wola, a village in east-central Poland. 26) Susz is one of the main food of the Christmas Eve supper table in Poland. It is a compote prepared from the blend of dried fruits and has a brown, muddy look. 27) Poles represent the biggest number of people by nationality to rescue Jews during the German Nazi-organised Holocaust, up to around 450,000 from certain death. Poland holds the world record with the most people at 6,135 being awarded the title of Righteous among the Nations by the State of Israel. 28) The Euro 2012 helped Poland to raise its public profile and marked its 20 year journey into "Central European Powerhouse". 29) It is the world's 6th producer of brown coal used by large power plants with 78 documented deposits, of which the exploited twelve have 2.1 billion tons. 30) The Polish alphabet consists of 32 letters. 31) A popular drink in Poland, orangeade or oranzada, is a sweet carbonated drink with an orange taste that originated in France and spread to Poland in the 18th century. 32) Nazi-occupied Poland was the only territory where the Germans decreed that any kind of help for Jews was punishable by death. Up to 50,000 Poles were executed by the Nazis for saving Jews. 33) Traditionally, the main meal of 3 courses is eaten around 2pm, starting with a soup, a main course of meat and a desert. 34) Polish dumplings or "pierogi" are one of national dishes and one of the best recognizable Polish food outside Poland. 35) Covering 1/3 of Poland, it's geothermal waters resources are ranked among the richest in Europe. Equivalent to some 3.5 billion tons of oil, it is sufficient for heating the houses of about 30 million people. 36) It's first documented ruler was Mieszko I in the 10th century. 37) Polish born Marie Curie or Maria Sklodowska (1867-1934) was the first and only Nobel laureate in two different sciences and first female professor at the Sorbonne University. 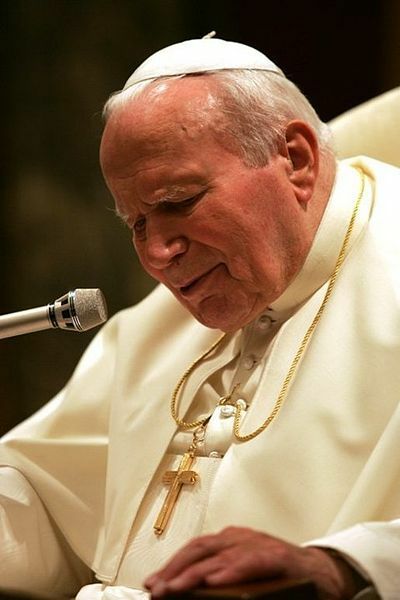 38) Pope John Paul II also known as Karol Wojtyla (1920-2005) was Polish. He was the only Polish Pope to date and served the second longest. Additionally he is credited with contributing to hastening the end of communism in Poland and throughout Central and Eastern Europe. His popularity resulted in a TV channel dedicated entirely to the Pope. His family home in Wadowice just outside of Kraków is now a famous site of Christian pilgrimage in Poland. 39) The 1st oil refinery in the world was built in 1856 by Polish pharmacist and petroleum industry pioneer, Ignacy Lukasiewicz. 40) Beer is often served with raspberry or blackcurrant juice (piwo z sokiem) and drunk using a straw. During colder seasons the popular refreshment is hot beer with cloves and cinnamon, sweetened with honey (piwo grzane). 41) Polish born astronomer Nicolaus Copernicus (1473–1543) was the first person to propose that the earth was not the center of the universe. Another Polish astronomer, Johannes Hevelius (1611-1687) published the earliest exact maps of the moon. 42) It is part of the 'Vodka belt countries' and has a history of producing high quality vodka for more than 500 years. They are made from specially selected variety of Stobrawa potatoes, rye or the grass Hierochloe odorata. BOLS from the Netherlands has also been produced in Poland since 1994. 43) The Katyń Massacre records the murder of some 22,000 of Poland's finest soldiers, academics, professionals and business owners in the 1940 by the Soviet Secret Police who were buried in the Katyń Forest in what is today Russia. 44) It boasts the most winners of the "World's Strongest Man" title. 45) Poles love their cold cut and Polish butcher shops or "sklep miesny" are known for their enormous selection. 46) KGHM Polska Miedz, 32 percent owned by the Polish government, is the 10th largest copper produce in the world with 543,000 tonnes in 2011. 47) It is estimated that more than 6 million Poles including soldiers and civilians died in concentration camps, labor camps, prisons, and forced labor during the 5 years of Nazi occupation.The historic site of the Auschwitz German concentration camp near Oświęcim is now a site of pilgrimage and monument to the prevention of war and suffering. 48) One of the most famous songs in Poland is the"Żeby Polska była Polską", a Polish protest song written in 1976 by Jan Pietrzak which became the informal anthem protesting the totalitarian Communist regime. Ronald Reagan named a speech after the song, and Queen Elizabeth II quoted from it in her speech to the Polish Parliament. 49) All Saints' Day on 1st November is an important religious holiday where Poles visit cemeteries to honour their loved ones who have passed away. 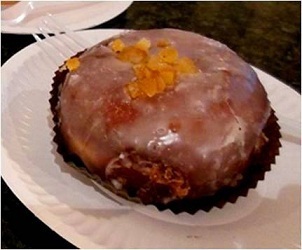 50) The "Paczki" or Polish doughnut is one of the most traditional Polish desserts appearing since the time of King Augustus III of Poland in the early 18th century. It is most consumed on the last Thursday or "tlusty czwartek", which is a Thursday before Ash Wednesday. It has been recorded that 100 million "paczki" are consumed every year just on this one day. 51) It was famous for its amber, transported along the Amber Route from the Baltic Sea to the Adriatic coast for over 1000 years. 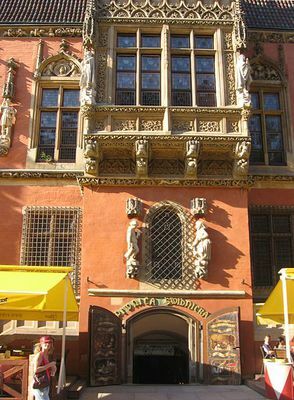 Gdansk on the northern tip of Poland holds the world famous Amber Market. 52) Poland is largely ethnically homogeneous with minorities including Ukrainian, Belorussian, Slovakian, Lithuanian and Germans. 53) It is home to one of the world's best preserved Neolithic flint workings (3500-1200 BC) and one of the most valuable archeological sites in Europe. 54) Wieliczka Salt Mine or "Kopalnia soli Wieliczka" build in the 13th century is one of the world's old salt mines still in operation until 2007. 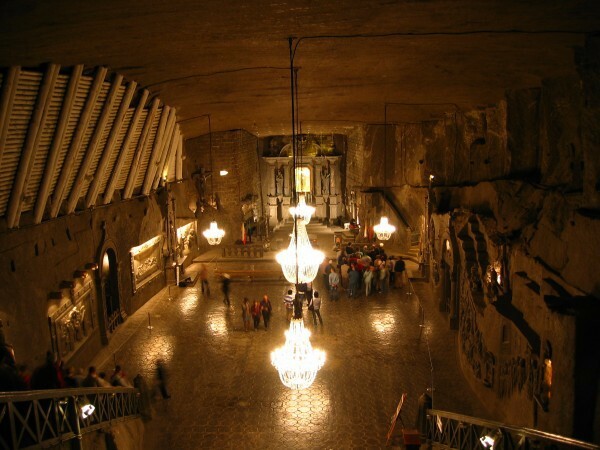 It is also referred to as "the Underground Salt Cathedral of Poland" due to its three chapels and an entire cathedral carved out of the rock salt by the miners and placed on the UNESCO list of the World Heritage Sites in 1978. 55) In addition to birthdays, Poles celebrate their name day or "imieniny", which is the day commemorating the saint they are named after. The names associated with each day is listed in all calendars in Poland. Just like birthdays, there are parties with food, drinks, presents and the singing of the traditional birthday song, "sto lat". And if you want to wish someone on their name day, just say "Wszystkiego najlepszego z okazji imienin!" Great article and interesting historical facts. I won't be going to Poland, but you made it come alive with your writing. .....born of Polish refugees in 1946....Polish resettlement in UK.....not only did I find these facts are true but recognized my genetic characteristics in the Poles when visiting..........exuberant and over the top!!! Polish Catholics saved about 50 000 Jews, the rest (400 000) survived because they escaped to Soviet Union. Great article! Good luck greeting someone on their name day in Polish! You wrote: "Historians believe that 284 Poles who were seen as threats to the communist regime were murdered and buried by Stalin's secret police between 1945 and 1956". The fact is that during those years tens of thousand of Poles lost their life from the hands o the Stalinis Communist regime. Those 254 were only a minor part of the total. I have been trying to find the original source for the info on "43 insurrections from 1600 to 1945" but it seems to simply be reproduced in different online sources, with nothing leading back to any original document. May I ask where you got this information from? EVERYTHING IS TRUE BY 140% about these facts . POLAND IS, was and still will be an AMAZING ONE of the KIND of NONE other countries that fought through insane extreme tough times ad with GREAT BRAVERY, HONOR OF ITS PEOPLE OF RIGHTS HAD ACCOMPLISHED GREAT UNSTOPPABLE SITUATIONS, THAT IS WHAT MAKES POLAND POLSKA WAY BETTER THAN ANY OTHER NATION LAND ON PLANET EARTH ITS TRUE VALUE OF LIFE WITH EACH OTHER OF ITS PEOPLE FOR CENTURIES. Estimates vary depending on source, though available data suggest a total number of around 60 million people worldwide (with roughly 21 million living outside of Poland, many of whom are not of Polish ethnicity, but Polish nationals). It is very nice list, thank you, but are some small mistakes. Regarding item 16, I am unsure what you mean but there was also WSK Mikrus after WWII which was entirely Polish microcar.. Also before WWII there was large luxurious Polish car made with terrible name of CWS T-1, again entirely Polish. And after WWII there was FSO Syrena which again was small car entirely Polish creation. There were also other Polish cars made, but many based on other country designs at least in part. For item 19, you mean Polski-Fiat 508 which was copy of Italian FIAT 508 - that is not really mistake, just that when Pole things of Polish Fiat, they think of later 125p - and these days 508 is quite rare to see ever except in museum or car show. Oh and there were also some other entirely Polish microcars/trucks too, but they were very rare and used most by government agencies like police and military. Finally item 44, there are countries that have had more than one strong man champion, Poland has had one but he is five time champion Mariusz Pudzianowski. What I mean is for example Iceland has had two very prominent champions each having won four times and Iceland may have had even more winners other than them too, not sure. Regardlessly, it was very nice list to read and I am very glad you had wonderful time in my homeland. Besides, it is very much true about the beer and candy, cheers! Some are debatable though! Like point number 7. I use this data for my presentations about Poland too, but numbers themselves alone don't say the truth. And the name in 4) is Strzelecki. Wow! Thanks for this great article. My husband is Polish and I really enjoyed reading so many interesting facts about his country. I am really excited about visiting Poland ins a few months!